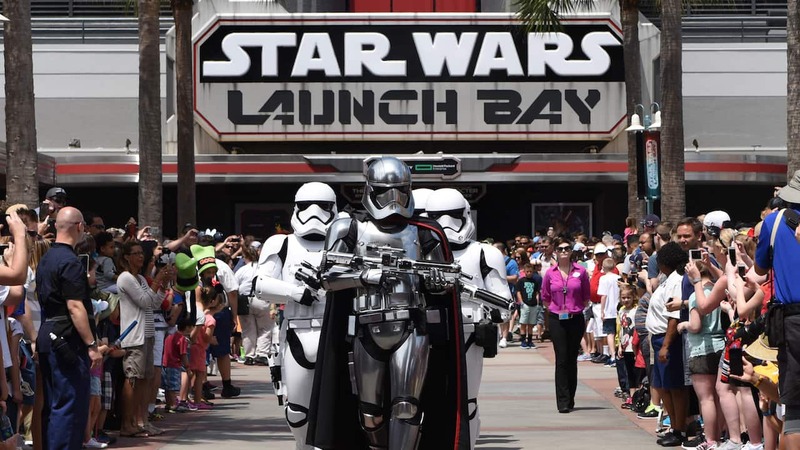 As we first told you in August, Star Wars-themed lands are coming to Disneyland Resort and Walt Disney World Resort. 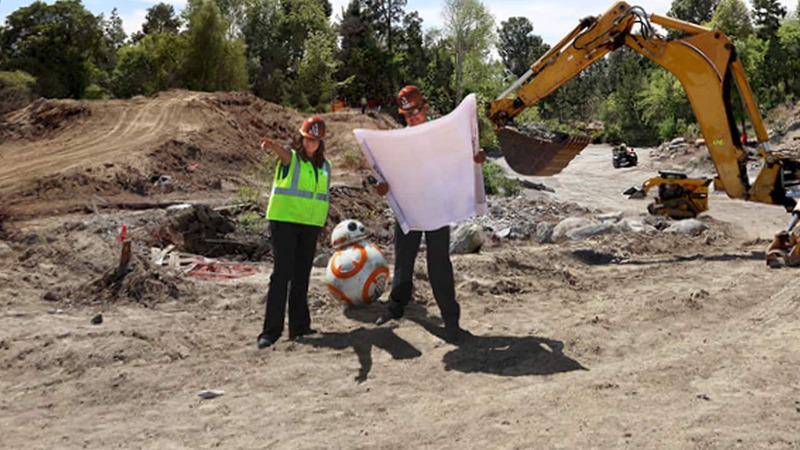 Recently we featured BB-8 and R2-D2 as they explored two mysterious locations, and many of you guessed correctly that they had discovered the construction sites for these all-new, immersive themed lands! Today, we’re excited to celebrate the official groundbreaking at Disneyland park in California and Disney’s Hollywood Studios in Florida with this exclusive 360-degree photo, produced with help from our friends at Littlstar, from the 14-acre construction site at Disneyland park. Take a look below, and keep a sharp eye out for some of the unique resources that are being brought to the project. In these all-new lands, guests will be transported to a never-before-seen planet inhabited by humanoids, droids and many others. Star Wars-themed lands will be the largest-ever single-themed land expansions at Disneyland Resort and Walt Disney World Resort. Keep an eye on the Disney Parks Blog as we continue to keep you updated on the progress of these galactic expansions. Why is it that looking at a whole bunch of “photoshop” items in a picture of dirt makes me smile and feel like a kid? Can’t wait to drive to Orlando and “moving” to my new home in Star Wars land. This is more of a technical question: What type of camera are you using to capture this 360 video? It’s about time those AT-AT’s did something useful. The incompetent First Order sent the crates to Disneyland when they are clearly labeled Walt Disney World. I’d hate to be there when Kylo Ren sees that. We love Disney and Star Wars they are both so magical, so magical in fact that a 70 foot transport doesn’t cast a shadow! Other than that slight slip we are very very excited…. The Matterhorn would be behind the trees you see above R2-D2. You can just see the castle on the left side of that group of trees and from that angle the Matterhorn would be a bit to the right of the castle. Where is the Matterhorn in this shot? You can see Fantasyland Theater and Big Thunder Mountain, but no Matterhorn between the two. From this angle, the top of the Matterhorn should be visible. Hi, we just booked our trip to Disneyland in California. Will the Season of the Force still be going on then? We love Star Wars. Thank you. Very Cool!! Thank you for the update!! Wow Wow Wow! Just zoomed in the hanger is shown in the photo still. Under the “X-WING FIGHTER”. Cover by the blue and white tent. To get all the way home turned on the Imac. First thing that pops up on the net. Starwars Land !!!!! First photo, weather cold enough for Starwars sweater missed the shuttle to the park. Smart enough to take a picture of “Dirt”. Ground breaking space dirt….. I can honestly say my first experience is that…..
Wow I was at Disneyland. My 1st Visit I walked from the Hotel. I seen the construction crew excavating the site. I felt a need to ask what they was doing. The employee looked down at my chest then looked back into my eyes and smiled. Thought it was wierd. Come to find out my first photo taken at disneyland is the soon to be Starwars land. Im so glad I had my wife take the photo, but in my photo theres a big hanger with a huge Wally Gator statue just as big as the hanger. Picture must have been photoshopped no empire, R2D2, or BB8. This is a pretty cool look at the Disneyland construction. Although it seems odd that the crates in the photo are labeled “Walt Disney World” when this is a photo of the Disneyland, CA construction site. Great to see all the progress that has been made on this huge project at Disneyland! I’ve been watching the demolition from Disneyland Drive for a couple months. Where will this land be located in Disney Hollywood Studios? Will there be a panorama shot of that project also? The AT-AT should have been blowing up an old building. Who else in the galaxy has more knowledge of massive construction projects than the Empire and First Order? The Rebellion/Resistance is more into repurposing existing buildings than creating new. Hi Erin, Any truth that the upstairs area in Innoventions will become a preview center for the star wars expansion? Hi Bill – I’m sorry, but we don’t have anything to share with regard to that space yet. The Empire isn’t so bad. They’re helping out with the construction.